Not Just Another Mother Blogger! : Where In The World? 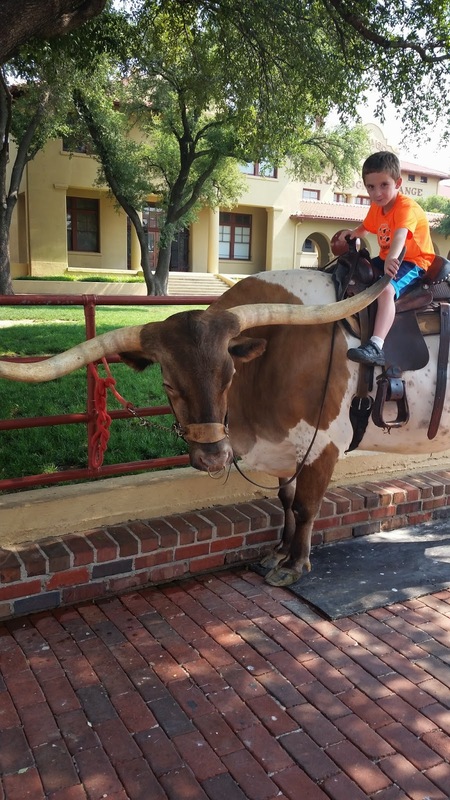 This is a longhorn, a type of cattle that Texas is famous for, at least back in the day. Can you imagine an entire herd of these, thousands of them, marching down the street? That's exactly what happened here in Fort Worth, Texas, once America discovered that beef is what's for dinner. While I do not recommend grabbing anything by the horn, this particular animal was docile and polite enough to allow Zane to sit on his back for a photo op. They still do a ceremonial cattle drive, with about twenty longhorns and several cowboys, twice a day, so visitors can have a little experience. It's pretty amazing. You can almost get a sense of the way it used to be in the Wild West. There's other things to do in Fort Worth, too, like the Zoo and several art galleries and museums. Check it out--it would make for an interesting family vacation. Seems like those horns could make walking in a crowd difficult! Love how Zane totally has things under control!